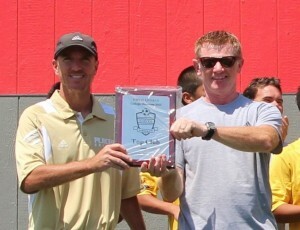 Ron Benjamin and Paul O’Brien bask in the glory of Placer United’s achievements at the Davis Legacy College Showcase series with Top Club honor. Placer United was named the “Top Club at the 2015 Davis College Showcase Series” with an impressive nine teams making the semi-final rounds, five moving on to play for championships, and four taking home the winners trophy and t-shirts. Congratulations to all our coaches, players and families on doing an outstanding job over the last two weekends in Davis. Great Job everyone! Go Placer!